The Medical Spa Here at Cosmetic Surgery and Dermatology of Issaquah offers advanced non-surgical anti-aging treatments for women and men who are not ready or interested in cosmetic surgery. We also offer treatments for teenagers or adults with acne including glycolic peels and extractions (acne surgery), some of which can be covered by insurance. Licensed Master Aesthetician, Leslie Carney performs all of the treatments in our medical spa. Leslie has been practicing here for 10 years, takes a very practical approach to educating patients on the benefits of treatments best suited for their skin-type, goals, and budget. You will find Leslie easy to talk to and a wealth of knowledge regarding her specialty. Patients walk away feeling confident in her hands and that she is willing to go the extra mile to help achieve patient satisfaction. To learn more about Leslie Carney click here. Medical Spa treatments include facial rejuvenation with Fortified Fraxel, Fraxel Facials, and SkinPen Microneedling. Ultherapy for skin lifting. Non-invasive body contouring with UltraShape, Vitalize and Glycolic acid chemical peels. Laser hair removal using the Gentle Laze laser. We also offer cosmeceutical skincare to complement any treatment plan. We carry SkinCeuticals, Skin Better Science, Neostrata, Glytone, and DCL. All treatments are medically supervised by Dr. Victor Michalak who is very involved with the review of patient treatments or part of the treatment process himself. 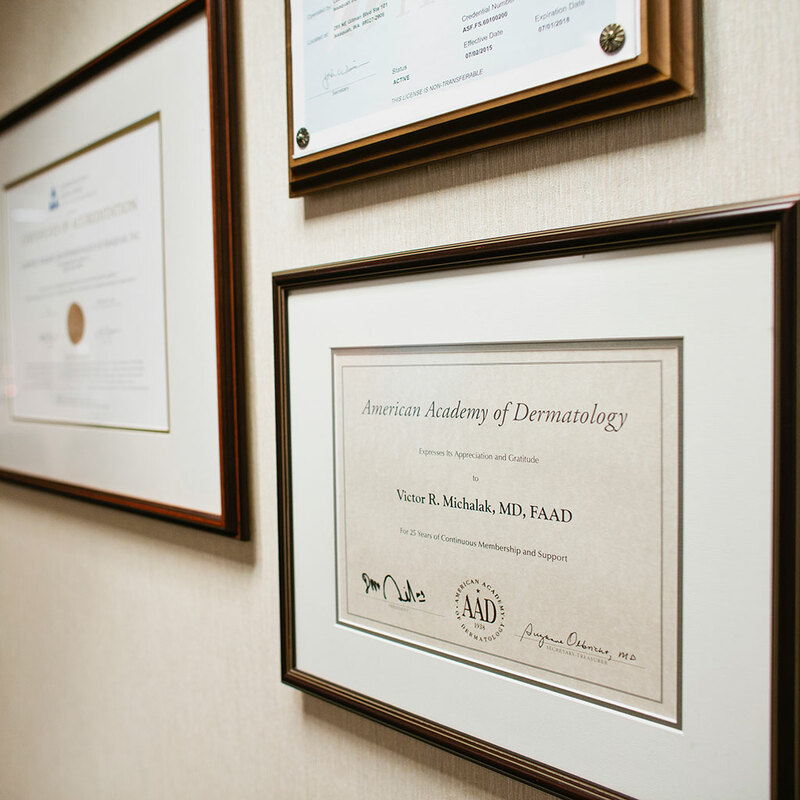 Prior to any medical spa treatments, we require patients to be evaluated by one of our certified physician assistants or Dr. Michalak to ensure the best outcome and patient safety. Please visit the pages listed below and learn more links to obtain full information about the services we offer. You can also inquire through the website or contact us for additional information. Regain your youthful glow with A Fortified Fraxel Laser Treatment! The newest facial treatment developed by Dr. Michalak offers a combination of a non-ablative Fraxel laser treatment along with rejuvenation. Patients experience increased skin tone and improve texture while stimulating collagen with minimal downtime. A new leading edge treatment called the Fraxel Facial uses a combination of the delicate Fraxel Laser which increases your skin's permeability and powerful, fast acting rejuvenation medications to smooth the surface of your skin, improve the color of your skin, and add new collagen with a single no downtime treatment. Your skin will look refreshed and renewed within days of the procedure. A series of Fraxel Facial treatments is recommended for more substantial results. Dr. Michalak is pleased to offer the most recent advances in laser hair removal treatment for patients desiring a comfortable, effective way to remove unwanted hair. With a beam of laser light, we can help you solve the problem of unwanted hair and unveil your naturally smooth skin. Laser hair removal technology makes it possible for laser energy to "select" only hair follicles, while sparing surrounding skin from damage. This brings the cosmetic results you want with the clinical results you need. A Chemical Peel is a skin renewal treatment that can be tailored to each individual’s needs based on skin condition, skin type and cosmetic goals. A chemical peel can treat a wide variety of unwanted skin conditions, such as fine lines and wrinkles, dull complexion, acne and blemishes, uneven pigmentation and more. We offer a variety of chemical peels and formulas for different patients and specific skin needs, from deep chemical peels to light chemical peels that require no downtime. Our signature facial uses the most medically advanced products available, to increase collagen and improve elasticity in the skin, stimulate cellular regeneration, improve circulation, and hydrate your skin. A facial is an individualized treatment designed for your skin type, condition, and current skincare needs. The result will leave you with a healthy, youthful glow. For the face or back, we offer acne treatments that emphasize proper exfoliation and extraction of pore-clogging debris. Extraction Treatments may also include a therapeutic mask. We offer both chemical and non-chemical exfoliation treatments to help address acne, hyper-pigmentation, fine lines and enhancement of overall skin texture. For patients looking to improve skin texture, reduce fine lines and wrinkles or have scarring, microneedling might be the treatment for you. Microneedling, also known as collagen induction, stimulates collagen and elastin production by creating thousands of precise micro-injuries in the dermis. Your skin then responds by turning on its own natural ability to repair itself, which results in smoother, healthier looking skin. SkinPen is the first and only microneedling device in the marketplace to be given FDA clearance. This medical device also has single-use sterile cartridges so they are safe for patients and cannot be re-used. Both factors are why Dr. Michalak chose this device. A good skin care program will enhance any in-office treatment and continue to improve results at home. Healthy skin that looks clear, free of discoloration and blemishes will help you to feel more attractive and confident. Cosmeceutical skincare is sold exclusively in dermatology practices because this type of product can have more active ingredients than its retail counterparts. Proper instruction and supervision help patients achieve better outcomes. We carry several cosmeceutical brands and skincare appropriate for the dermatology patient. Licensed Master Aesthetician Leslie Carney is happy to develop a skincare regiment that is right for you.